Dividing by a fraction is the same as multiplying by its reciprocal. You can use the expression "Keep, Change, Flip" to help you rewrite a division problem as a multiplication problem. When you're dividing by a fraction, first rewrite it as a multiplication problem using the steps above. Then follow the same steps for multiplying fractions. To multiply fractions, you multiply straight across. You can simplify before or after multiplying. Let's look at an example. In the example above, we didn't need to simplify 8/15. If you need to do some simplifying, make sure not to simplify until you've rewritten the problem as a multiplication problem. A common mistake is for students to try to simplify at the beginning before changing it to multiplication. If you're dividing a fraction by a whole number, there's one extra step that you'll need to do. Write the whole number as a fraction first by using 1 as the denominator. The rest of the steps will be the same. If your division problem involves any mixed numbers, first rewrite them as improper fractions. The rest of the problem will be the same. 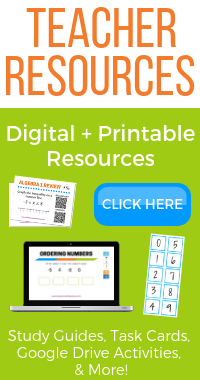 ​Need a review of multiplying fractions?